I've said it before and I'll say it again. Paul Kearney remains what could well be the most underrated and underappreciated fantasy author on the market today. Best known for his military fantasy and epic fantasy novels/series, The Wolf in the Attic represents a vastly different sort of tale from what he has accustomed us to. It's an enchanting and magical story, akin to the sort of bewitching books Neil Gaiman is known for. This one reminded me of The Ocean at the End of the Lane, yet it resounds with way more depth. I'm aware that Kearney had doubts regarding this latest work of his, what with it being so unlike anything else he had written in the past. But here's to hoping that The Wolf in the Attic will win him new fans, readers who will then discover the original, compelling, and entertaining backlist which for some reason never garnered him the recognition he rightfully deserved. The historical backdrop for this tale is Oxford, England. It's 1929 and Anna Francis and her father now live in Oxford after being forced out of Smyrna by the Turks and rescued by a British ship. The young girl has memories of her sunny and warm birthplace, but now everything is cold and dreary. Greek myths were part of her educations as she grew up, but her father has seemingly turned his back on their previous lives and traditions, and even changed their name so they can integrate into this new, foreign culture. The integration of refugees following the destruction of their homes is one of the main themes explored within this novel and I feel that Kearney did an excellent job weaving this throughout the book. In many ways, The Wolf in the Attic is a coming of age story of a young girl who is a stranger in a strange land. Poor Anna lives a very sad and lonely life. With only her doll Pie for a friend, she is home-schooled and most of her existence revolves around the house she lives in. While her father holds meetings with other Greek expats and squanders whatever money they had left when they were forced out of their home, Anna explores the house as well as Oxford and its surroundings. Making an eleven-year-old girl your first-person narrator could have been tricky, especially since this is no YA novel. And yet I found Anna to be a great POV protagonist. Although young and often childish, she is nevertheless thoughtful and insightful. Without her perspective, The Wolf in the Attic would never have been as magical and whimsical. Having her as the only POV character definitely gave the book its unique "flavor." The only true weakness of this work would have to be the supporting cast. Understandably, with a first-person narrator the entire tale must be shouldered by Anna's POV. And yet, I felt that more depth could have been given to the secondary characters. Especially Luca, who has a great role to play before the conclusion of this story. I feel that fleshing out Queenie and Jaelle a little more could have gone a long way. The same goes for the Roadmen and the Romani and their age-old rivalry. Considering that the publisher found it important enough to include their presence in the blurb, one would have thought that both C.S. Lewis and J.R.R. Tolkien would have a somewhat important role to play at some point in the story. But they serve very little purpose and could have been changed for any other nameless figures and it wouldn't make a difference. Weighing in at only 288 pages, The Wolf in the Attic is a relatively short book. The pace is never an issue and all too soon you sadly reach the end. This is definitely the kind of novel you wish would have been longer. I got through this one in just a few sittings. This one reads more like an historical novel than a fantasy novel at first. The supernatural elements are introduced slowly and are deftly woven into Anna's tale. This is a beautifully written and crafted book, probably Kearney's best one yet in terms of prose. But when Anna's life is turned upside down, all of sudden the mystical elements take center stage and you find yourself in an authentic fantasy story. 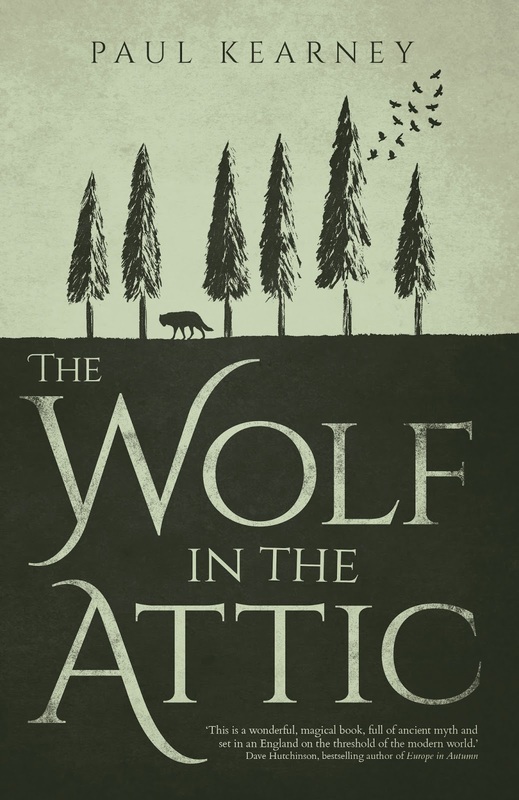 Paul Kearney did it again and The Wolf in the Attic is a captivating work featuring a charming and engaging young protagonist who is forced to make important decisions that will change her life. Definitely one of the speculative fiction titles to read this year! I've just finished reading this book and I really enjoyed it. I agree that there could hav ebeen more story. When I reached the end, I nearly expected to learn there would be a sequel, becuase so much is left unspoken. But then I wonder whether this is the purpose of the story. To guide the reader on the road, but then let them go their own way with their own devices. Tricky, but it worked for me. The same goes for the characters. Yes, many of them have clearly a lot more to give than the story lets out, but again, I wonder whether that space is left for us readers to explore, especially reguarding Tolkien and Lewis (I'm a Tolkien fan and I absolutely loved the echoes of Tolkien's work in the story). This is really a unique book. I'm very happy I've coem across it.